The Interfaith Hunger Coalition invites people of all faiths to join us in our Fifth congregational Hunger 101 Workshop. The workshops are created to help congregations involve members of faith communities in becoming involved in helping fight hunger in their immediate neighborhood, in Albuquerque and in New Mexico. 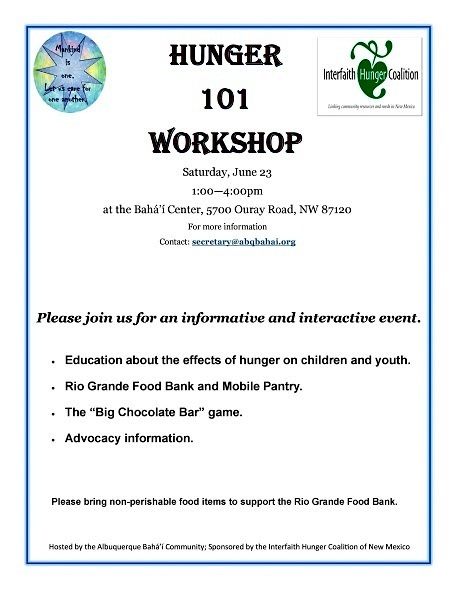 The workshops provides information about hunger in New Mexico as well as information about opportunities for direct service and for advocacy. Workshops have been held at First Presbyterian Church, Our Lady of the Most Holy Rosary Catholic Community, the Jewish Community Center and Congregation Albert. A abbreviated version of Hunger has also been held with Church Women United and the Presyterian Women of the Presbytery of Santa Fe.